Marble and Granite. Installed in a timely and proffessional manor. Marble and Granite. The Hint of Affordable Luxury. Marble and granite along with other choices of natural stone such as limestone, travertine, slate and sandstone to name a few, can change the look and feel of a room dramatically. Natural stone has been a popular housing and building material all over the world for hundreds of years. It is used in entryways, kitchens, bathrooms, patios, floors, fireplaces, facades and many surfaces in homes and offices. Wondering what kind of floors to put in your bathroom? 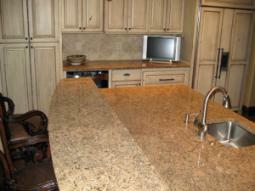 Maybe you want to replace those old scratched up kitchen counter tops with a natural stone top such as granite? Natural stone can add such a classic look and feel to a room. Not to mention adding extra value to your home or office. A room can have a feeling of "coolness" or "calmness" and tile can also give a room that "warm, fuzzy feeling" as well. No matter if you live in the Upstate of SC., the desert area of Arizona or in the high Rocky Mountains of Colorado, marble and granite lends itself to any interior. You can tell I love natural stone. Every piece is unique, developed by nature over millions of years. There are colors and textures to fit all most everyone's taste and of course your decor. Colors range from black, dark browns, tans, greens, blues, reds, and yellows to almost white. Generally marble is best suited to bathrooms and fireplaces and comes in a range of colors also - whites, tans, browns and yellows. Here at Superior Stone & Tile, LLC we can help you make those decisions. With over 35 years of experience in custom tile installation and slab stone work,our customer satisfaction is our top priority and we pride ourselves on our superior service. The phone # is 864-449-5446. Thank you for visiting us while our web site is under construction. The Marble and Granite Blog for Superior Stone and Tile, LLC. keeps you up-to-date with all additions and changes to the superior-stone-and-tile-sc.com Web site. Marble and granite furniture is in a class by itself. Add life to old tabletops and display your favorite piece of art on a granite pedestal. Beatiful marble tile in your bathroom shower. Natures beauty surrounds you. Beautiful custom made fireplace surrounds. Installed proffessionally to make an exquisite looking firplace. 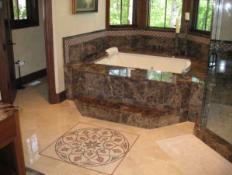 See photos of some of our completed tile installations and granite counter tops. Contact us at superior-stone-and-tile-sc.com using our easy, quick form. Would you like to share your knowledge about stone and tile? Great, find out how you can submit your story or tip here.